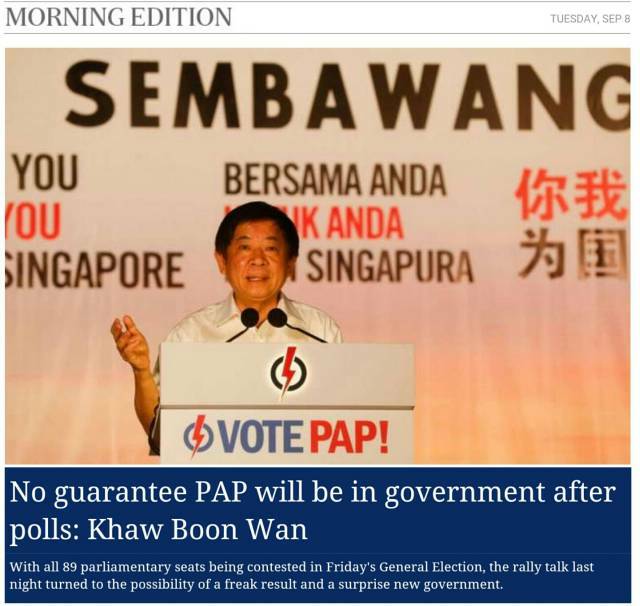 Blogging for Myself: GE 2015: Vote PAP or Oppo? GE 2015: Vote PAP or Oppo? Facebook was the social media phenomena back in GE 2011. This time round I am too busy to read most of what Facebook carried to me. In GE 2015 it is Whatsapp that is getting my attention. I just wrote the following to my friends. As usual there are pro and anti PAP camps. This is my suggestion to them. Not everyone should vote PAP. Singaporeans should understand the unique situation we are in and act accordingly. I would be alarmed (not just worried) if the PAP gets 70% of the popular vote. If they have more than 65% I would be worried. The sweet spot is about 60%. I think this is the support that would stop them from behaving like dictators and listen to the ground carefully. If you are hard done by the PAP policies you should vote against them. If you are doing well by their policies but somehow feel that it was not right and empathize with those who suffered from those policies, you should vote against them according to your conscience. Your vote is your right and to be respected. Just be thankful you have a chance to vote. Non PAP candidates make even bigger sacrifices to offer you that choice. Nevertheless don't create a freak result, neither give the PAP more than 65% support. But never worry about a freak outcome either. Make calm estimates and go with it. Leave it to the PAP to worry because it is sad to live in fear. You might as well not be a Singaporean than to live afraid all the time. Before responding to my Whatsapp chat, I caught the summary from ST.
Khaw is a shrewed politician. See how ST reported him, especially the red underlines. 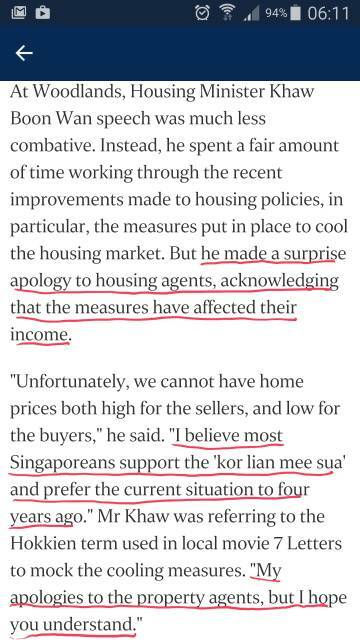 Khaw apologized for hurting the rice bowls of housing agents. He cannot turn water into wine, much less feed thousands with a few loaves of bread and fishes. He made a painful trade off. He wanted to publicly record that he knows their pain and that this will not last forever. Well he sort of gently remind them that they had it good earlier on. In this sense housing agents that join the game late didn't get the chance to feast in order to survive the famine. That's life. Many housing agents wouldn't vote PAP but some might be persuaded. This is our system. If you want to be happy here try to find your way to be with the majority because policies are always designed to win elections that way. This is not America which is unique in a totally different way from us. Theirs is a "tyranny of the minority" and nothing gets done unless compromise is struck. We are more like the British with the "tyranny of the majority" but the Brits are also markedly and so materially different from us because they have a much freer media. That changes everything. What a coincidence of timing! Well we have come to expect such words from them every GE. At least as far as I know there aren't any words from the Oppo telling us not to worry or be afraid of voting for them. Correction: I just read them after posting this update. I wonder how one vote when he rejects PAP and demand better opposition contesting in the constituency....spoiling the vote? IMHO, please don't spoil the vote. You may want to look at it this way, one needs to have first, before one can have it good. Yep, do not spoil the vote. For now put aside what you want and just in your view choose the best of what is available. Especially the choice in your estimate will take you to what you want eventually. Maturity in a democratic society is not to spoil a vote. Might as well say you do not need voting at all. Be responsible for what you cast - as simple as that, be true to yourself. Vote according to your belief. Don't let fear rules your life. I enjoy so much of life whenever I do what I believe in. If you are bullied, remember to vote against the bully. Don't let him bully more and more people. This year I donated money against The Bully. I took picture with one who stand up against The Bully. I put the sign "Singaporeans First" with a Hammer & an Empower Signage. It felt good to dispel the fear perceived within & without against The Bully. GE 2015: Who was out of touch? More car accidents in our future?